Former U.S. Army Chief of Staff General Raymond Odierno elaborated a vision for the Service’s future that left many questions unanswered. Specifically, he called for the Army to be more expeditionary as well as more scalable, tailorable, and regionally aligned. General Odierno’s successor and the current Army Chief of Staff, General Mark Milley, similarly has spoken of the need for the Army to be “agile,” “adaptive,” and “expeditionary,” and to have an “expeditionary mindset.”1 Lieutenant General Gustave Perna, writing in the March–April 2016 issue of Army Sustainment, has also evoked the imperative of having an “expeditionary Army.”2 What, however, do these terms mean? What would it take for the Army to realize the generals’ vision, and what, if any, are the associated risks? A recently published RAND study of French army operations in Mali in 2013 noted that in many ways, France’s army epitomizes the characteristics General Odierno and General Milley have highlighted. It is a living example of a technologically sophisticated force that checks all of the generals’ boxes; it does well precisely the things the generals call on the U.S. Army to do. Studying how the French army has organized itself and operates provides insight into what their ideals might mean in concrete terms for the U.S. Army and the associated benefits—but also the implied compromises and risks U.S. planners need to consider. When comparing the strengths of the French and U.S. armies, it must be acknowledged that there is little the French can do that the ever-adaptable U.S. Army cannot. However, the Army’s general-purpose forces arguably are not designed and organized to deploy and fight on a small scale (at the brigade level or below), and the Army normally does not create company- and battalion-size units from multiple parent organizations, something the French do routinely. There is usually a cost incurred when organizations do things they are not designed to do.3 American planners, moreover, appear to have different understandings of what constitutes “enough” in terms of force protection, vehicle protection, capabilities, and so forth.4 The French, in contrast, operate on a small scale by design and doctrine and appear to have an altogether different understanding of sufficiency. aligned regionally so that operating units are familiar with local cultures, personalities, and conditions. Turning now to the French army, we find that it embodies many of the desired attributes mentioned above. Of particular interest, however, is not the degree to which the French army is expeditionary, but rather what the French example implies for U.S. Army assumptions, as well as the risks involved if it were to become more like the French. 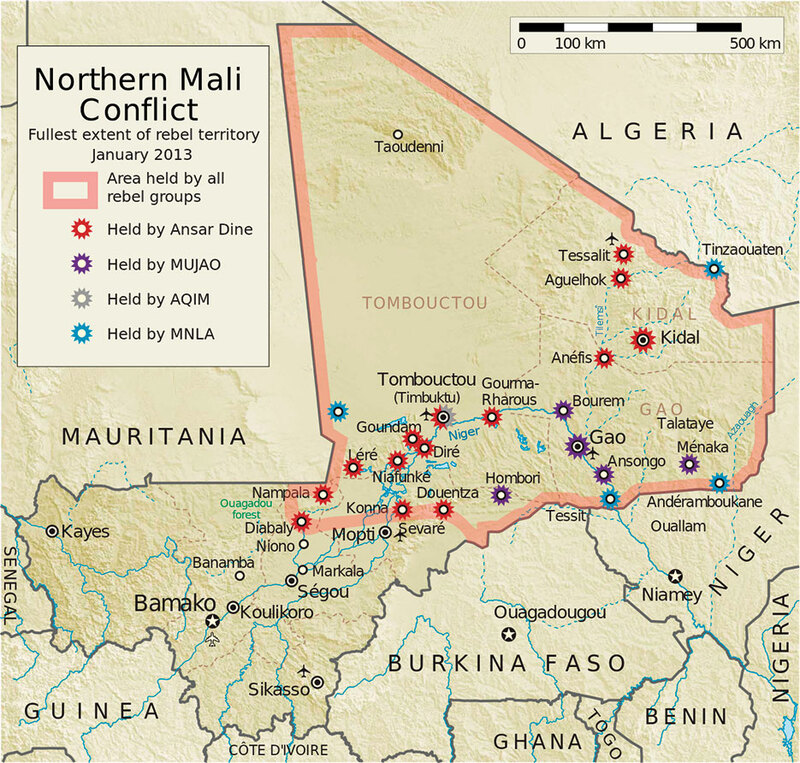 The French Operation Serval began on January 11, 2013, the day after Islamist militants who had already seized control over northern Mali began an offensive that threatened the nation’s capital, Bamako. France first responded by committing to the fight special forces (SF) assets that were already in the region. While the SF focused on stopping the offensive and rallying Malian army defenders, France rushed general-purpose troops into theater. The first to arrive—also on January 11—were units flown in from Chad, where they had been engaged in a long-running operation. Other units drove in from Côte d’Ivoire, while still more units began arriving from France. By January 15, the French had stopped the militants’ offensive and begun advancing north to seize control over the broad strip of land on either side of the Niger River, commonly referred to as the Niger Bend because of the river’s curving path. The Bend includes northern Mali’s most populous towns, Gao and Timbuktu. The French employed fast-moving armored columns combined with airborne and air-land operations, coordinated with SF and with air support from the French air force. The French took Gao on January 25 and Timbuktu 4 days later. They kept moving quickly, securing distant Kidal—the epicenter of Tuareg militancy—by January 31, and Tessalit on February 8. The campaign climaxed in February and March as French and Chadian forces converged on the Adrar des Ifoghas mountains, where remaining militants made a last stand. By late spring, the “major combat operations” phase of Serval was complete. Serval continued on a smaller scale until it officially came to an end on July 15, 2014, when it was subsumed into a new regional counterterrorism operation, Barkhane. Nine French soldiers lost their lives fighting in Mali between January 11, 2013, and July 15, 2014. The French in Mali demonstrated a number of features of interest to this article. These include the French army’s approach to task organization, which is related to how the French organize their force; France’s prioritization of mobility over protection; the army’s regional alignment; and finally its expeditionary culture, which relates to all of the above. The French in Mali demonstrated an ability to tailor their forces, deploying relatively small task-oriented formations. Although it is difficult to compare the French and American armies, in our assessment of the French forces deployed to Mali compared to U.S. norms, we believe that the Americans would have sent a larger force with a proportionately larger support element. What the French do—and what they have designed their army to do—is measure out their forces in small increments and aim for “just enough.” That involves, among other things, the ability to disaggregate and re-aggregate formations on the fly as well as the will to accept a good deal of risk. Setting aside the unknown number of SF troops who were present in Mali before Serval began, the French contingent in Mali—whose northern half alone is roughly the size of France—started at zero. Moreover, rather than first gathering strength and then committing to the field à la Operation Desert Shield, the French fielded their units as they arrived in theater, often company by company, platoon by platoon. For example, the first non-SF group to arrive in Mali was a 200-man sous-groupement tactique interarmes (SGTIA), a company-scale combined arms task force that was detached from a battalion-size groupement tactique interarmes (GTIA), or combined arms task force, operating in Chad. Two days later, another SGTIA arrived from Côte d’Ivoire by road. The largest single formation to arrive in Mali as a group was a full GTIA of mechanized infantry that reached Dakar, Senegal, by ship, and then drove the rest of the way. The total force reached roughly 3,400 by the end of January and 5,300 by the end of February. Of those, according to the French military, 1,500 were support personnel, or 28 percent of the overall force.10 Several experts on U.S. Army operations consulted for this study indicated that a comparable American force (that is, with comparable capabilities) would have required a larger logistical tail of approximately 40 percent, suggesting that the United States would have had to field a larger force overall. The French deploy in small numbers in part because they would struggle to do otherwise. Their forces are few and are overcommitted to overseas deployments, and they have no strategic lift of their own. However, the French—perhaps in light of their weak logistical capabilities—arguably have made a virtue of necessity by designing their forces to deploy and operate on a small scale and tailor their forces to meet specific needs. The French pushed modularity to well below the brigade level. They did this in the 1990s as part of a number of sweeping reforms intended to transform the army from a large conscription-based continental force designed to fight the Soviet Union into a smaller, more expeditionary force. (By law, the French military could not deploy conscripts overseas, thereby forcing the army to rely on an “army within the army” consisting of fully volunteer formations that historically had a colonial vocation. Chief among them are the Foreign Legion and the “Troupes de Marine,” or Marines, who in the 19th century were part of the French Navy.) The French understood that in order to pack as much capability as possible into a smaller force, that force would have to be modular and flexible.11 The army dissolved its divisions in favor of brigades, which became force providers, and placed regiments at the center of gravity. The French in 2015 revived its divisions, but operationally speaking, there is little change, and what really matters now as in 2013 are the French army’s task-organized and scalable battalion- and company-level task forces, GTIAs and SGTIAs. SGTIAs and GTIAs have the same structure but are different in terms of scale. SGTIAs are composed of a core of four platoons—three infantry and one armored, or vice versa—together with a command element and those support elements deemed necessary, often including some indirect fire capability as well as joint fires coordinators of various possible types. A captain commands the force. GTIAs are larger, composed of four companies—three infantry and one armored, or vice versa—with a command element and those support elements deemed necessary. A colonel commands. Additional platoons or companies can be tacked on as needed up until the task force reaches a limit of eight. In Mali, several GTIAs operated simultaneously, each with distinct areas of operation or missions and all under the command of a brigade-level headquarters established in theater, led by a brigade commander. Thus, the French created a provisional Serval brigade. Only some of the forces participating in the operations, it should be noted, are from the brigade commander’s home brigade. The exact composition of GTIAs and SGTIAs varies according to mission requirements and the resources at hand. SGTIAs in Afghanistan reportedly were large and diverse owing to the numerous requirements associated with operating there, which included everything from indirect fire to human terrain teams. The GTIAs and SGTIAs in Mali were smaller and in fact did not comply with the doctrinally mandated 3/1 structure, reflecting some combination of commanders’ estimation of the force size required and unit availability. For example, GTIA 3, which participated in the Adrar des Ifoghas offensive in northern Mali in February 2013, consisted of three companies (one mechanized infantry, one armor, and one engineering). It also had an artillery component consisting of two Caesar self-propelled howitzers and four 120mm mortars, communications and electronic warfare elements, and tactical drones. In the case of planned deployments, such as those that were slated for Afghanistan, GTIAs and SGTIAs are more homogenous with respect to home regiments and brigades. They also train and deploy together as SGTIAs, cycling through France’s national training centers as such. In addition, French officers are trained to function in and command GTIAs and SGTIAs. Commanding SGTIAs, for example, is part of the formal training for French army captains, which includes working with officers of other branches to ensure that they know enough about how the others do their jobs to understand how to work effectively with them. Presumably, collective and individual training of this sort reduces the turbulence that might be associated with cobbling units together on the fly in response to emergencies. The French assess that mobility is more important than protection, and they gamble that being able to move quickly provides more protection than heavier armor. French doctrine emphasizes rapid coordinated movements calculated to maintain the operational initiative—precisely the kind of campaign the French conducted in Mali. This approach worked there, although it is not clear how well French armored units would hold up against a more sophisticated enemy equipped with antitank guided missiles (ATGMs) or other standoff precision weapons. We also must wonder if the French would make the same tradeoff if they had more robust logistical capabilities, including a fleet of C-17s. Particularly important to the French are the relatively light logistical requirements associated with light wheeled armor. Indeed, given the generally poor infrastructure in countries such as Mali and France’s weak logistical capabilities, anything that reduces the logistics burden is an advantage. French logistical capabilities, it should be made clear, were stretched to their extreme limits in Serval, even with airlift borrowed from allies. The troops that France rushed to Mali initially had with them only the essentials (in many cases, 3 days’ worth of food and 9 liters of water), and the subsequent focus of logistical efforts remained on providing the bare essentials (food, water, fuel) as troops raced north and east.20 France also assumed responsibility for sustaining the Chadian force; it may well have done the same for some of the other African contingents in theater. The statements about Serval contain a great deal of bravado, but they make clear that the French had little in the way of excess sustainment capacity. Any savings such as that which might have come from using wheeled versus tracked vehicles probably helped a great deal. France’s choice of vehicles also gives its army a degree of flexibility regarding how it gets its units to the theater of operations and moves them around once there. Most vehicles arrived in theater by air, but a significant portion drove to Mali from points elsewhere in West Africa. As mentioned, some reached Mali by driving from Senegal or Côte d’Ivoire. The French army is, for all intents and purposes, a regionally aligned force. Setting aside their long colonial experience on the continent, the French know Africa well. All French army units rotate through Africa on 4-month “short-duration missions.” France’s explicitly expeditionary brigades—that is, the historically “colonial” units that conduct the lion’s share of the country’s overseas operations—also conduct 2- or 3-year “long-term missions” in Africa. The payoff was evident in Mali, where the French were able to make up for their own small numbers in part by calling upon regional and local allies, with whom they know how to work effectively. The most obvious example was the 2,250-man Chadian contingent, which played an important role in some of the most intense fighting in the campaign. Also of note is the French army’s work with the Tuareg contingent in the Malian army loyal to General Haji ag Gamou, whose men provided the French with invaluable help, primarily by scouting and translating. Working with ag Gamou’s men did not come without risk, however, given that he represents a particular faction within Tuareg society and has a long history of conflict with other Tuareg notables, particularly ones hailing from Kidal and the elite clans of the restive Kel Adagh confederation. What must be stressed, though, is that the French almost certainly knew what they were doing and understood all the pertinent ramifications and risks. The French, in other words, arrived in Mali already knowing the human terrain and did not have to race to get up to speed. A less tangible yet significant factor in French operations in Mali is the expeditionary culture that serves the French army well when operating at a small scale with limited resources. This might be particularly true of France’s specifically expeditionary units, most if not all of which historically have had an explicitly colonial vocation, most obviously the marines and the Foreign Legion. These, it should be stressed, are not SF (although there are French marine SF regiments as well as commando-qualified legionnaires) but rather general-purpose forces with a long-standing expeditionary mission and outlook. Since the reforms of the 1990s, however, this expeditionary culture is also apparently true of the historically continentally focused regiments that now share responsibility for overseas deployments and rotate through Africa alongside the former colonials and distinguished themselves in Operation Serval. Among the aspects of colonial operations that arguably have some relevance for today is the small size of French deployments, the degree of autonomy that unit commanders exercised, the high degree of risk they accepted, and their interest in leveraging local knowledge. French colonial forces were invariably small and relatively ill resourced, reflecting France’s priorities (protecting the homeland) and its determination to colonize cheaply or not at all. Badly outnumbered and for the most part operating autonomously and without the possibility of timely reinforcements or relief, colonial commanders—often just captains and below—learned to leverage local knowledge. Indeed, France owes its success in northern Mali during the colonial period in part to the commanders’ practice of attending to local politics and the human terrain so as to better deploy divide-and-conquer tactics, forge military alliances, and so on. Commanders knew whom to trust, whom to promote, and whom to push aside. French officers interviewed by the author also draw a distinction between how they are taught to operate and the “American way,” with which they have become familiar in Afghanistan. According to a French marine who had been involved in Serval, for example, the U.S. Army can fight “properly” in the sense that it can think in terms of going about an operation the best way. In contrast, he stated, the French army sees itself as having to make the best of whatever resources may be available. Thus, he explained, planning for Serval was an exercise in thinking through what was and was not available and coming to terms with the associated risk. Waging war on the cheap necessarily translates into risk, especially if one favors close combat, as the French officers above claim. In contrast to the U.S. Army, which can be described as a “belt and suspenders” institution, which often uses backup or redundant systems, the French army considers such amenities a luxury. Thus, it operated in Mali at or beyond the limits of its sustainment capabilities with a force structure, vehicles, and other elements carefully and optimistically calculated to be little more than sufficient: just enough troops, just enough force protection, just enough helicopters, just enough vehicles with just enough capabilities, and so forth. According to the French senate, for example, the VABs and VBCIs used in Mali were not equipped to counter improvised explosive devices (IEDs) for the simple reason that those that were so equipped were all in Afghanistan.29 Moreover, although VBCIs offer better protection and other capabilities than any of the other vehicles used in Mali, only 36 VBCIs were used there, compared with 177 venerable VABs. There were so many VABs and other out-of-date light-armor vehicles in Mali partly because the French had been gambling that they were good enough. If they thought otherwise, they presumably would make replacing them a higher priority.30 As it happened, the enemy did not make effective use of its antitank weapons or IEDs and did not possess ATGMs. But the French could not have been certain that would be the case. If we break apart the first point, modularity, we find important differences with respect to training and the authorities and responsibilities bestowed upon company commanders, which facilitate the kind of decentralized and distributed operations associated with mission command. Indeed, French officers interviewed for a separate study on interoperability claim to be on the extreme end of the mission command scale relative to their North Atlantic Treaty Organization Allies with respect to the degree of autonomy and responsibility they invest in lower echelons and their commanders. Whereas the French appear confident that their success on the battlefield and low casualty rates demonstrate the proficiency of their military, we are reminded of Napoleon’s alleged remark that the quality he looked for the most in his generals was that they be lucky. Moreover, Serval does not shed light on France’s capacity to handle more intense conventional conflicts or to provide the conventional deterrent power that U.S. commanders and French defense policy alike call for. Given the French example, it appears that moving the U.S. Army toward being more expeditionary would require revisiting decisions regarding force structure, the kinds of armored vehicles the Army uses, and how it task-organizes. Does the BCT structure make the most sense? We must also question the premise that one can be more expeditionary while retaining all other capabilities. Given limited resources, we would have to give up something. In this case, it might mean losing some ability to conduct large-scale conventional warfare or quite simply demoting protection as a priority for vehicle design. Becoming more like the French would also mean having a culture premised on austerity and learning to be comfortable bringing much less to the fight than what one considers ideal. In the end, having a “small footprint” in the French way would mean assuming greater risk. *Michael Shurkin is a Senior Political Scientist at the RAND Corporation. This article was published in the Joint Force Quarterly 82, which is published by the National Defense University. 1 “Advance Policy Questions for General Mark A. Milley, USA, Nominee for Chief of Staff of the Army,” July 21, 2015, available at <www.armed-services.senate.gov/imo/media/doc/Milley_07-21-15.pdf>. 2 Gustave Perna, “Projecting an Expeditionary Army,” Army Sustainment, March–April 2016, 2–3. 3 For a discussion of some of the turbulence associated with task-organizing to reflect assigned missions that differ from designed missions, see Christopher G. Pernin et al., Readiness Reporting for an Adaptive Army (Santa Monica, CA: RAND, 2013). This work details ways in which units have had to scramble to redesign themselves to meet changing operational requirements and the associated turbulence. 4 Task Force Hawk is a classic example of the Army’s institutional resistance to “going small” and to deploying only a portion of an Apache unit without the full panoply of support elements and a large contingent intended to provide force protection. See Bruce Nardulli et al., Disjointed War: Military Operations in Kosovo, 1999 (Santa Monica, CA: RAND, 2002). 5 Raymond T. Odierno, “The Force of Tomorrow,” Foreign Policy, February 4, 2013, available at <www.foreignpolicy.com/articles/2013/02/04/the_force_of_tomorrow>. 6 “Army Vision—Force 2025 White Paper,” U.S. Army Capabilities Integration Center, January 23, 2014, 2. 7 Army Doctrine Reference Publication 3-0, Unified Land Operations (Washington, DC: Headquarters Department of the Army, 2012), 1–7. 8 The U.S. Army Operating Concept: Win in a Complex World, TRADOC Pamphlet 525-3-1, U.S. Army Training and Doctrine Command, 2014, 44. 10 French army G4, email to author, May 5, 2015. 11 For more on French army reforms and the embrace of modularity in the 1990s, see Paul Brutin, “L’Armée de terre, les réformes, l’armée de demain,” La Jaune et la Rouge: Revue mensuelle de l’association des anciens élèves et diplomés de l’école, November 1997, available at <www.lajauneetlarouge.com/article/larmee-de-terre-les-reformes-larmee-de-demain#.VBIkZeevyD4>; François Lecointre, “De la fin de la guerre à la fin de l’armée,” Institut Jacques Cartier, September 5, 2012, available at <www.institut-jacquescartier.fr/tags/modularite/>; Michel Klein, “Armée de Terre: armée d’emploi,” Fondation pour la Recherche Stratégique, February 14, 2007. 12 FT-02, Tactique Générale (Paris: Centre de doctrine et d’emploi de forces, 2008), 41–43. See also FT-04, Les fondamentaux de la manœuvre interarmes (Paris: Centre de doctrine et d’emploi de forces, 2011). 13 “Par les airs et par la piste: L’ouverture du théâtre Serval,” Béret Rouge, May 2013. 14 “Scorpion Excites French Combat Vehicle Industries,” Defense Update, n.d.
15 Ministère de la Défense, “Le programme SCORPION,” Armée de Terre, March 16, 2015. 16 Michel Goya, “Dix millions de dollars le milicien: La crise du modèle occidental de guerre limitée de haute technologie,” Politique Étrangère, no. 1 (2007), 201. 17 “L’engagement des forces prépositionnées en Afrique,” Béret Rouge, May, 2014, 6. 18 François Marie Gougeon, “Témoignage d’un chef de corps engagé dans l’opération Serval,” Opération Serval: Le retour de la manœuvre aéroterrestre dans la profondeur (Paris: Centre de Doctrine d’Emploi des Forces, 2014), 50. 19 Le mantien en condition opérationnelle des matériels militaires: des efforts à poursuivre (Paris: Cour des comptes, 2014); Ministère de la Défense, “Question No. 47347 de M. François Cornut-Gentille,” Assemblée Nationale, July 8, 2014. 20 Céline Brunetaud, “La chaîne soutien en opérations: À coups d’expédition,” Terre Info Magazine, May 2013, 10. 21 Philippe Chapleau, “Rusticité et ingéniosité: Malgré tout, les véhicules tirent la langue au Mali,” Lignes de Défense, March 30, 2013. The same blogger put the number of vehicles operated by the Serval brigade at 730, including 150 VABs, 100 VBLs, 36 VBCIs, and 20 AMX-10RCs. 22 Etienne Monin, “Les derniers jours de la guerre dans l’Adrar au Mali—France Info,” France Info, March 25, 2013. 23 Bertrand Darras, email to author, April 28, 2013. 25 Interviews with French logistics officers, March 2015. 26 A 2010 issue of the French military publication Doctrine Tactique refers to this as “global maneuver” and associates it with counterinsurgency. See “La Manœuvre globale: Cadre général de la contre rebellion,” Doctrine Tactique, no. 19. 27 Interview with Frédéric Garnier, October 2, 2013. 28 Personal communication with a legionnaire, Carlisle, PA, November 7, 2012. 29 Jean-Pierre Chevènement and Gérard Larcher, Rapport d’information fait au nom de la commission des affaires étrangères, de la défense et des forces armées par le groupe de travail “Sahel,” en vue du débat et du vote sur l’autorisation de prolongation de l’intervention des forces armées au Mali (article 35 de la Constitution), French Senate, April 16, 2013, 20. 30 The planned replacement for the VAB is the VBMR, which has not yet entered production. 31 The last time that particular unit, the 2nd REP, did a combat jump was at Kolwezi, Zaire, in 1978, when 450 legionnaires jumped in daylight into a city held by hostile forces and took fire as they jumped. The legionnaires were outnumbered and outgunned and spent the day in firefights. Five were killed. 32 Interview with French G4, Paris, February 5, 2015. 33 Interview with French logistics officer, Lille, France, February 3, 2015. 34 Interview with French logistics officer, Lille, France, February 2, 2015. 35 Interview with French G4, Paris, February 5, 2015. 36 Doctrine d’emploi des forces terrestres en zones desertiques et semi-desertiques (edition provisoire) (Paris: Centre de Doctrine d’Emploi des Forces, 2013), 43; Philippe Roux, “RAND Corporation Conference: French Army Update Sahel Operation ‘Serval’ Lessons Identified,” PowerPoint presentation, RAND, Arlington, VA, October 23, 2013.